Most TEDS programs (including PhD Systematic Theology and Historical Theology) use Turabian Humanities style. This style is also known as bibliography or footnote style. The reference manuals are the latest versions of Kate Turabian’s A Manual for Writers and The Chicago Manual of Style. Both books are available online through the library. Counseling and Mental Health use APA style for both citation and formatting. The reference manual is the latest version of the Publication Manual of the American Psychological Association. The PhD Intercultural Studies (ICS), Educational Studies (EDS) and Doctor of Ministry (DMin) programs use Turabian Social Sciences style. This style is also known as reference, parenthetical or author/date format. The reference manuals are the latest versions of Kate Turabian’s A Manual for Writers and The Chicago Manual of Style. Both books are available online through the library. 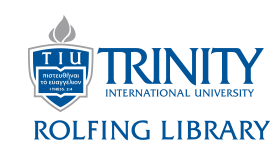 The PhD New Testament and Old Testament programs use the Society of Biblical Literature (SBL) style reference for footnotes, bibliography and abbreviations. For all other matters, follow the Turabian Humanities style. The reference manuals are the latest versions of The SBL Handbook of Style, Kate Turabian’s A Manual for Writers and The Chicago Manual of Style. College students should follow the following styles for their major. When in doubt, ask your department or professor for further instructions. REACH students use APA style for both citation and formatting.